I remember it was like yesterday, although over 10 years have gone. We were driving on a side road in Cozia Mountain, on 24th December 2004 when Lionel shouted: STOP! In front of us, on a branch, a beautiful Ural Owl was looking to us. In a deep silence Lionel with his friend Jöel Bruèziere took few shots, and then the bird disappeared in the forest. After a search of decades, that was the first encounter of Lionel with the Ural Owl , his “Christmas present”, like he used to saiy. President of Cercle Ornithologique de Lausanne from Switzerland, Lionel Maumary kept going traveling to Romania often, looking for birds and other wild animals, especially in Transylvania and Danube Delta. But, we didn’t see too many Ural Owls since then. 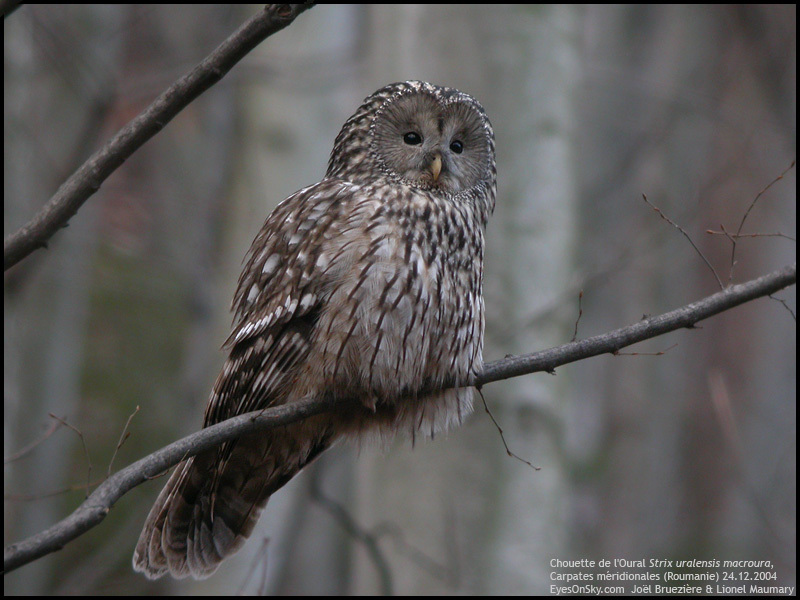 The Ural Owl has an extended distribution area in Europe and Asia, from Sakhalin, Japan and Korea in the east to Scandinavia in the west. In central Europe it is an upland species, preferring deciduous woodland. The population in Romania is stable at about 1000 pairs within the last years. It usually occupies open woodland and is more often found in moist rather than dry areas. It nests in hollow tree trunks, occasionally in old raptor nests, and increasingly in nest boxes. As a celebration of 10 years since the first time he saw the owl, Lionel contacted me a while ago with this proposition to build and to fix few nests here in Romania at few locations were this bird was seen frequently. He financed the biggest part of the project and I was in charge also with the logistics. Therefore it wasn’t an easy task to fix them up at 4-8m, the nests being quite big (50x50x100cm) and heavy (12kg). First location was chosen at Muntele Rosu (Red Mountain), named thus because of the carpet of red Rhododendron (Balkan Kotschy’s alpenrose heaths) that use to cover the heights of Ciucas Mountains every June. The owl was seen by friends of mine while they were there last Decem ber. We fixed the nest on a big beech tree, facing the forest edge, which is guarded by majestic pine trees. Then I call the owl, knowing there are reduced chances to get an answer. Surprise! It came after few minutes, arriving from the woods. Still too far, but I took a long shot. Next place we went is near Brasov, on the way to Poiana Brasov resort. Here we had to change the proposed location because the area is affected by forest cuts. Close to the place we fixed the nest one can have a beautiful perspective over Brasov town, one of the seven important urban areas (aka citadels) – Siebenbürgen – of the so called Transylvanian Saxons, a Germanic population who settled here starting with the 12th century. In the middle of the old town we can distinguish the imposing building of the Black Church, considered the biggest Gothic church from SE Europe. We continued our journey by going North at Dealurile Homoroadelor. The region is inhabited in big proportion by ancestors of another ethnic group called Székely. They arrived in Transylvania a little earlier than the Saxons. Being considered the finest warriors of medieval Transylvania, the Székely were sent by the Hungarian leaders after incorporating this territory into the new Hungarian Empire, to settle the East Transylvania at the foot place of the Oriental Carpathians in order to defend the border against the invaders that might come from east. The landscape still presents a medieval land-use pattern –forested ridges and riverbed, pasture and hay meadows on gentler slopes and terraces, arable land with smaller meadows o n the flat valley bottoms near villages. Here we’ve got help from Ambrus Lácá, an excellent and trustworthy local guide from Odorheiu Secuiesc. We set a first location for two nests. Before to begin we had a visit of a beautiful owl, but the evening light didn’t give me the chance for a good picture. Next day we continued to advance to North, reaching almost 1000m altitude. The highest peaks of Harghita Mountains were very visible not far away. The weather was changing, a cold wind and a snow layer in the woods made us to realize we’re still in January. Well, not too cold for the bears… considering the fresh foot marks! We were not very impressed, so we fix another two nests. Maybe next spring we will have the chance to see owls and bears in the same location. Then we head West, not Far West… Just close to Sibiu, another beautiful medieval town created by the Saxons, considered the second biggest urban center of the Habsburgic Empire in the XIXth century. The location chosen here is a beautiful mixed forest, Dumbrava Sibiului, a place were I saw the bird in 2013. The last place we’ve been during this trip was in Cozia Mountain, to mark this 10 years milestone of a beautiful friendship I started with Lionel in 2004, when we’ve seen the Ural Owl together. I was able to identify the exact location, although at that time I didn’t have any GPS to mark the spot. A funny moment was created by a buzzard that seemed to be very curious about us, while we were installing the nest. Anyway, the nest isn’t on his taste, I am sure he wasn’t interested to take it! After a journey of three days, 8 nests installed, and 1000kms traveled we arrived home with the hope that the Ural Owl will appreciate our effort and find the nests appealing enough to become their new residences.